The League City Garden Club will meet on Wednesday, November 14, 2018 in the Johnnie Arolfo Civic Center, 400 W. Walker St., League City. Please join us for 10:00 am Social, followed by our program at 10:30 am. The topic will be Best Watering Practices. 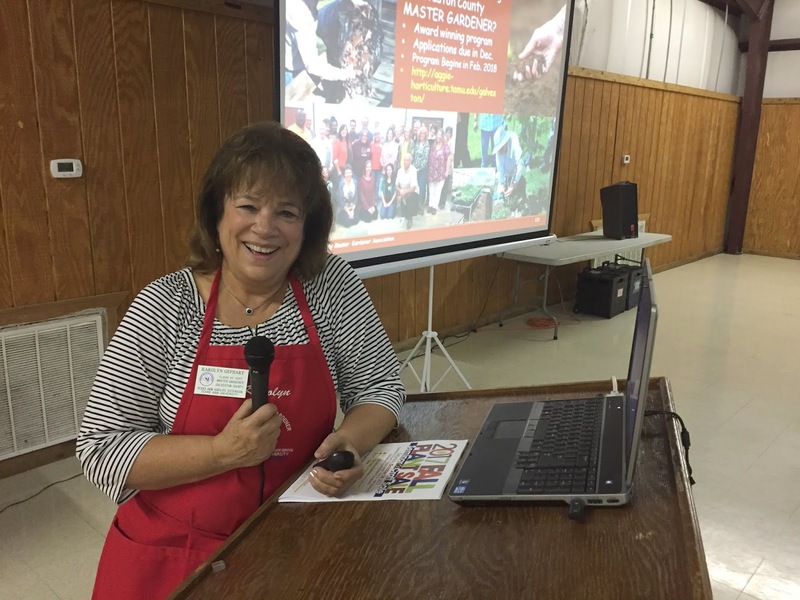 Our guest speaker, Karolyn Gephart, is a Galveston County Master Gardener and an active member of the Heritage Gardeners of Friendswood. Retired from Friendswood ISD where she was the Director of Communications, Karolyn is now a reporter for the Reporter News in Friendswood, Pearland and Manvel. Originally from Texas City where she taught Journalism at TCHS, she and her husband, Joe, live in Friendswood. The League City Garden Club will hold its next meeting on Wednesday, October 10, 2018 in the Johnnie Arolfo Civic Center, 400 W. Walker St., League City. Please join us for 10:00 am social, followed by our guest speaker, Camille Goodwin, will present a program entitled 'All About Bulbs'. Camille is a retired NASA program analyst who became a Galveston County Master Gardener in 2008 and leads the bulb selection and sales for the Galveston County Master Gardener plant sale. 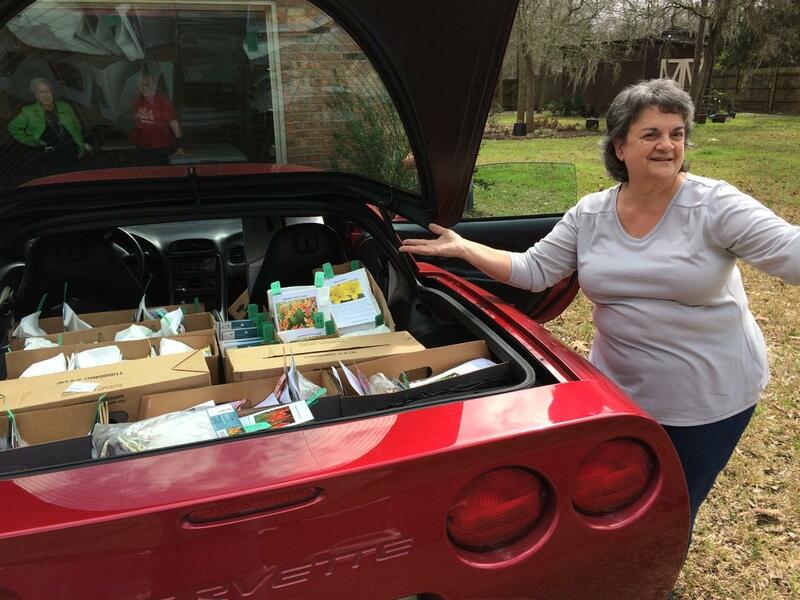 League City Garden club announces their 8th Annual Garden Walk "Moving on With Friends and Family". Saturday September 22, 2018 10 a.m. - 4 p.m. Ticket costs are $15 and are available at Nana's Attic, 501 E. Main St., Founder's Square and Gripon Gardens at Lynn's, Inc., 2060 Pecan Orchard Rd, both in League City. Maps are included. In addition, tickets can be purchased from any garden club member. It was decided we will be having a craft and plant sale the day of our Garden Walk (Sept 22nd). We will also be raffling off a wagon filled with garden items. However, we need your help! We also need plants and crafts for the sale. The focus will be on the more unusual plants and crafts. Plants that are not easily acquired are preferred; not the common plants such as spider or asparagus ferns. Holiday or sports themed crafts sell well. Contact Judy Anderson or Judith Taub if you have plants or crafts to donate. National Garden Clubs (NGC) has selected a new daffodil cultivar. It has been registered with the Royal Horticultural Society as N. ‘Plant America’. Brent and Becky’s Bulbs will donate a percentage of the sales to the PLANT AMERICA Community Project Grants Fund. This bulb will be available for purchase exclusively by NGC members for three years before it goes on sale to the public. There is a LIMITED amount of stock available for purchase this fall, as is typical in the first year of a new cultivar. For the second and third years, the number of bulbs available will be much larger. N. ‘Plant America’ can be ordered starting today by phone or email from Brent and Becky’s Bulbs using the order form that is available on their website. Reminder Wednesday, July 11th at 11am is our summer luncheon at the Red River BBQ in League City. This will be a self-pay function. We will meet in the private room. The Summer Luncheon is important because it is the kickoff for the Fall Garden Walk (September 22, 2018). Tickets will be available to pick up so you can sell them. We will also be filling in the Garden Walk docent roster. 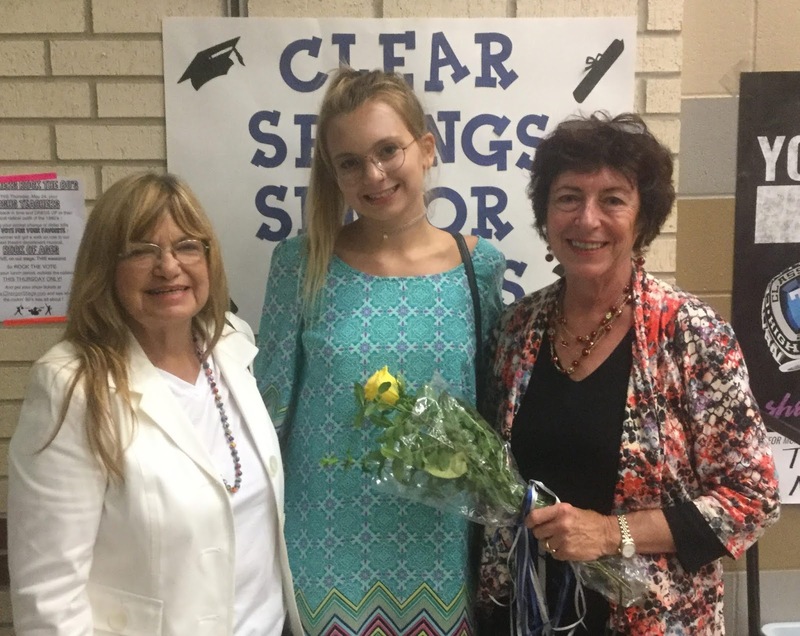 We are pleased to announce the League City Garden Club 2018 Scholarship winner is Hadley Lowery, a senior at Clear Springs High School. Hadley is headed to Texas Tech to study Environmental Engineering. We can’t wait to see her bloom! Congratulations Hadley! Our club has awarded over $31,000 in scholarships to 17 graduating seniors since we began handing out scholarships in 1985. Pictured left to right is Judy Anderson, LCGC Vice President, Hadley Lowery, and Linda Garren-McKillip, LCGC President. Please join us for the summer luncheon on Wednesday, July 11th at the Red River BBQ in League City at 11am. The final year end meeting (May) for LCGC will be a private gathering at a member's home. LCGC takes a break from their monthly meetings during the summer months. Please check back for information on our Summer Luncheon which will be Wednesday, July 11, 2018. We will resume our regular meetings in September 2018. Our next meeting will be held at the Environmental Institute of Houston at UHCL located at 2700 Bay Area Blvd., Houston, Texas. Please note the change in venue! You may want to join a carpool to drive to UHCL. Click here to learn more about the field trip. We are happy to announce the League City Garden Club is offering a scholarship to a graduating senior. If you know someone, please help us spread the word. Robin Stone Collins will present a program called "Using Hypertufa in the Garden". 10 a.m. social gathering, 10:30 a.m. presentation. We meet at the Johnnie Arolfo Civic Center, 400 West Walker Street in League City.